British rider Cal Crutchlow saw his chances of recording another top five MotoGP finish ruined by a late mistake in yesterday’s German Grand Prix at the tight and twisty Sachsenring. The Monster Yamaha Tech 3 rider was lamenting his lack of aggression in the early stages of the 30-lap race after he got involved in a race long scrap with team-mate Andrea Dovizioso and factory Yamaha rider Ben Spies. Crutchlow said he should have attacked sooner and broke away with 2010 world champion Jorge Lorenzo for third and he was regretful for wasting too much time chasing Dovizioso’s YZR-M1. When the 26-year-old though did finally try and make a decisive attack, it cost him his status as the leading non-factory rider in the 2012 points standings. Trying to make up for a speed deficit on the Sachsenring straight, Crutchlow made the smallest of mistakes in the braking zone for the tight first right-hander and ran off into the gravel trap on lap 26. He lost seven seconds and dropped back to 11th before fighting his way back into eighth. The small mistake cost Crutchlow a lot. Had he made the pass on Dovizioso stick then he would likely have secured his maiden MotoGP podium after Casey Stoner launched his Repsol Honda into the gravel trap on the final lap. Dovizioso gratefully accepted Stoner’s gift to score his third podium in the last four races and he moved ahead of Crutchlow into fourth in the world championship standings. 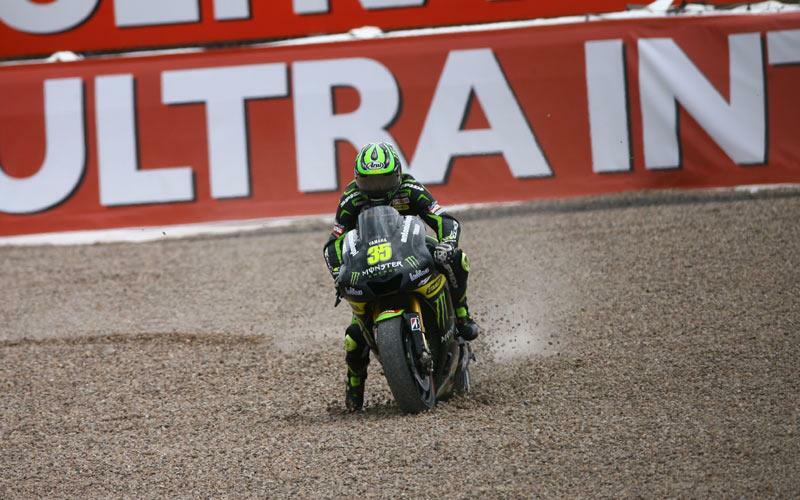 Crutchlow told MCN: “It was a stupid race and I should have done so many things differently. I was pleased with the performance but my race craft was s**t, simple as that. "I should have gone at the start with Jorge and when I passed Andrea I should have gone. But he passed me straight back and I got held up for 20 laps. I had the pace to be with Jorge no problem but I sat behind Dovi for way too long. One of the reasons was I had no straight-line speed. "Every time we would go out of the last corner he would take 0.3s out of me and I haven’t got a clue why. We definitely had the pace to run with Jorge and I should have gone with him. But when I settled down I thought I would just sit behind Dovi. "I’d planned the whole race in my head but with five laps to go I was in the gravel. I was way out of my depth braking into turn one because of the speed disadvantage and I was playing catch-up each time going in there. We still proved our speed and as soon as I made a mistake my next lap was almost my fastest. "It was a missed opportunity but we again proved our speed and eighth is better than 14th from last year and I take the positive from that. But I made a stupid mistake and it was my own fault and I am not blaming anyone. For more coverage from the German MotoGP race, see the July 11 issue of MCN.